Astronomers using the Chandra X-ray Observatory have spotted a mysterious pulsing x-ray beacon near the north pole of the giant planet. March 7, 2002: Every 45 minutes a gigawatt pulse of x-rays courses through the solar system. Above: Every 45 minutes an x-ray source blinks near Jupiter's north magnetic pole. , based on data from the Chandra X-ray Observatory, shows the hot spot pulsing 15 times during one complete 10-hour rotation of the giant planet. "We weren't surprised to find x-rays coming from Jupiter," he continued. Other observatories had done that years ago. The surprise is what Chandra has revealed for the very first time: the location of the beacon -- surprisingly close the planet's pole -- and the regular way it pulses. NASA's Einstein x-ray satellite first spotted Jupiter's x-ray glow in 1979. No one looked again for many years until researchers (Gladstone among them) pointed the German x-ray observatory ROSAT toward Jupiter in 1992. The glow was still there. Scientists wondered ... what was it? The x-rays came mostly from Jupiter's northern hemisphere, but the Einstein and ROSAT maps weren't crisp enough to reveal exactly where. Some researchers figured they were seeing x-ray emissions from powerful auroras. Indeed, says Gladstone, Jupiter has "Northern Lights" just as Earth does -- only on a different scale. Jupiter's auroras are hundreds to thousands of times more powerful than our planet's. Furthermore, the glowing rings around Jupiter's magnetic poles are twice the diameter of Earth itself! Auroras happen on both worlds when electrons and ions rain down on the upper atmosphere. Such particles are guided by lines of magnetic force toward the poles where they slam into air molecules and cause them to glow. An important difference between auroras on Earth and Jupiter concerns the source of the charged particles. On our planet, most of the raining electrons and ions come from the solar wind or from our planet's ionosphere. 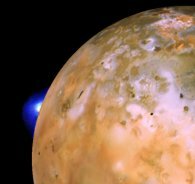 On Jupiter, many of them come from volcanoes: hot belching vents on Jupiter's moon Io fill the giant planet's magnetosphere with ionized sulfur and oxygen. Ions from Io are accelerated by local electric fields toward Jupiter's auroral zone. When Gladstone and colleagues trained the Chandra X-ray Observatory on Jupiter they expected to find the planet's northern x-rays coming from its giant auroral ring. After all, the auroral ring of our own planet is an x-ray source -- Jupiter's would likely be the same. "We used Chandra's High Resolution Camera to image the planet during a 10 hour period on Dec. 18, 2000," says Ron Elsner, an x-ray astronomer at the NASA Marshall Space Flight Center who worked with Gladstone. "We hoped it would pinpoint the x-ray source better than earlier satellites had managed." And indeed it did. But the new image was a surprise. Chandra revealed that most of the x-rays came from a hot spot located very close to Jupiter's north magnetic pole -- not from the auroral ring itself. Furthermore, it pulsed! Above: A composite image of Jupiter, its glowing auroral ring (blue), and a north-polar x-ray pulse (pink). Gladstone notes: "The x-rays we detected were 'soft' -- less energetic than 1 keV and less penetrating than the mildest of medical x-rays." It poses no danger to astronauts or Earthlings. While the researchers were using Chandra to observe Jupiter, two NASA spacecraft -- Cassini and Galileo -- were near the giant planet. Galileo was deep inside Jupiter's magnetic field, while Cassini was outside sampling the solar wind. Neither craft detected 45-minute variations in their surroundings, such as plasma waves or surges of energetic particles, "although such variations have been detected by Galileo at other times," notes Gladstone. Galileo has also picked up 1 to 200 kHz-frequency radio bursts that come and go with a 45-minute period, as did the Ulysses spacecraft when it flew by Jupiter in 1992. "Maybe Jupiter's magnetic field, when it gets hit by a solar wind gust, rings like a bell with a 45-minute period," speculates Gladstone. It would make an impressive bell indeed: Jupiter's magnetic field is the biggest thing in the solar system -- larger even than the Sun. Or perhaps, he continued, "x-ray producing ions might be bouncing back and forth between Jupiter's north and south poles." The poles are connected by magnetic field lines that take some fast-moving particles about 45 minutes to traverse. It's possible that Jupiter's south pole is also an x-ray hot spot, blinking at the same rate as the north -- but no one knows because the south pole is not as easy to see from Earth. One thing seems clear: The fact that the known hot spot is so close to Jupiter's north magnetic pole means that Io does not feed it. "There are no magnetic field lines that connect Io to the north pole," adds Gladstone, "so we have to consider other sources of ions -- like the solar wind." Solving the puzzle will require more data. "The next step is to gather some x-ray spectra," he says. "If we see spectral lines from volcanic elements like sulfur and oxygen, then we'll know that Io is involved -- even if we don't understand how." On the other hand, spectral lines from carbon and nitrogen would indicate the solar wind as a source of ions. Until then Jupiter's x-ray beacon -- relentlessly pulsing, and not where it ought to be -- will likely remain a mystery. Editor's Note: To learn more about this research, please see "A pulsating auroral X-ray hot spot on Jupiter" by Gladstone et al., which appeared in the Feb. 28, 2002, issue of Nature (v. 415). During the Chandra observations, NASA's Cassini and Galileo space probes were also monitoring Jupiter. In 1992 the ESA-NASA Ulysses spacecraft detected 45-minute radio surges from Jupiter. More images of Jupiter's auroras and the mysterious x-ray hot spot. Jupiter Hot Spot Makes Trouble For Theory -- a NASA press release. The Magnetic Field of Jupiter -- It's the biggest thing in the solar system. More credits: The High Resolution Camera used for these Chandra observations was built by the Smithsonian Astrophysical Observatory in Cambridge, Mass. NASA's Marshall Space Flight Center in Huntsville, Ala., manages the Chandra program. The Smithsonian's Chandra X-ray Center controls science and flight operations from Cambridge, Mass.